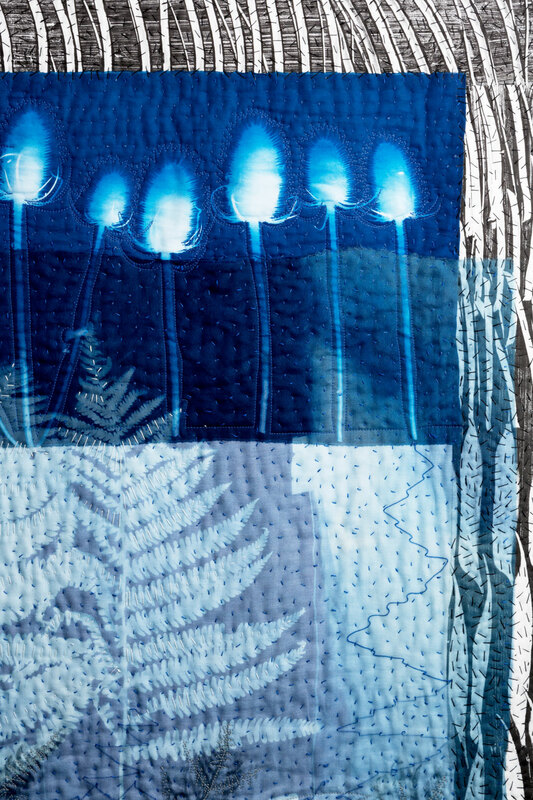 With a career spanning over 40 years, Pauline Burbidge has long been recognised as a leading textile artist and an important force within the quilting sphere. Pauline’s multifaceted approach to quiltmaking often sees her combine her love of colour, drawing, stitching and the natural landscape to create unique and expressive quilts which have even been purchased by major museums and galleries like the V&A, the National Museums of Scotland and the Whitworth Art Gallery, in Manchester. We caught up with Pauline to talk to her about her recent projects, approaches and career defining moments. At the moment I am working with some new Cyanotype Prints, including prints of ferns and elder leaves. I am hoping to turn them into a couple of larger scale wall hangings – my ‘Quiltscapes’ as I call them. 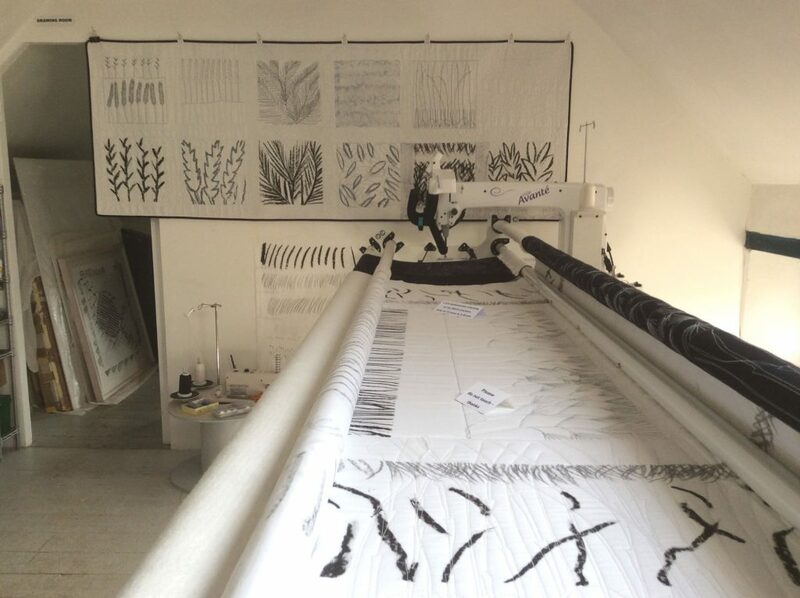 I am also half way through one of my ‘Quiltline’ pieces, a large quilt with drawings of hedgerows making the graphic black lines on white fabric. I am stitching it on my large ‘Handi Quilter’ machine – I love to use this and draw with my stitching line. This piece of work can be used practically or as a wallhanging. What is your first memory of quilting and who taught you? I made a garment, on my degree course, for the final show. I had completed a study project about armour, and loved the shapes that were made in the metal. I thought I could make something of these types of shapes in my garment making (I studied Fashion/Textiles at St. Martins Art College, in London) and felt that the fabric needed ‘body’ to keep it’s shape, therefore I thought of quilting it. I made a little jacket, with soft flowing sleeves and a very shaped & tailored body, echoing the armour shapes. As a child I was also often occupied with stitching and knitting projects, that my Mum often encouraged, but I don’t have any recollections of quilting projects. Do you think that creativity is something that can be taught or nurtured? Definitely nurtured along, a lot of care has to be taken to give yourself time to create. It doesn’t all happen instantly! What is it that you are most proud of to date? Selling a major piece of work ‘Lindisfarne Revisited’ to the Shipley Art Gallery, with helping purchase funds from the Art Fund. The string of recent major exhibitions that I have had, my Retrospective exhibition (in 2012) at the Festival of Quilts; ‘Quiltscapes & Quiltline’ at The Bowes Museum and The Ruthin Craft Centre; ‘Quiltscapes’ at The International Quilt Study Center Museum, USA (IQSCM); ‘Songs for Winter’ our recent joint exhibition (held with, my husband Charlie Poulsen) at Edinburgh City Art Centre. And having many works purchased by many Museums. What sort of changes have you seen in the craft over time and any predictions for future trends? I have seen the changes of crafts going from being cottage crafts to more sophisticated creations (as being promoted by the early years of the Craft Council). And today, I see more of a link with design, maybe some links with product design. I would suggest a good balance of some design projects to help support the studio practice. Which artists inspire you personally? They come and go – I often really enjoy solo exhibitions, as I can begin to ‘get to grips’ with the artists aims. Fine artists, examples being Sean Scully, Matisse, David Hockney, The Impressionists- generally. Photographers – Georg Gerster, Karl Blossfeldt. Textile artists (often not named) to name the categories more would be mud cloths from Mali; simple two colour block prints from India; some Ikat weaving from Japan; Indigo dyed fabrics. 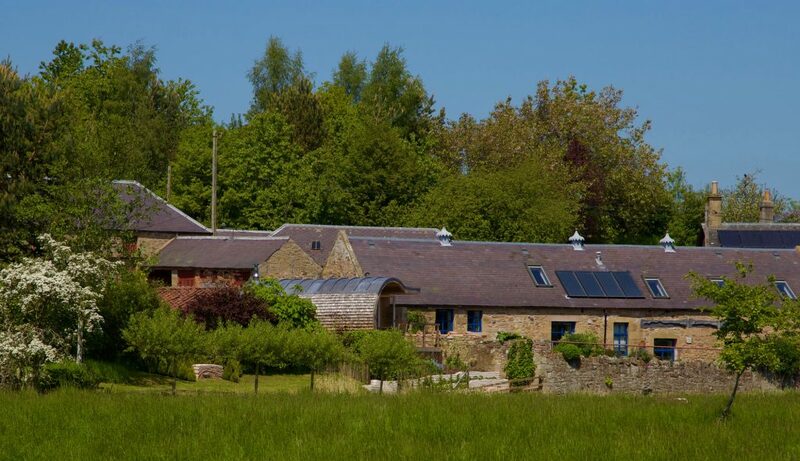 You live in a very beautiful area in a lovely building – do you find yourself incorporating aspects of them into your work? Of course! It’s the natural world around me that inspires me mostly. The growth & form of plant life, the wonderful coastline & beaches, the huge open skies, and the seasonal changes. I draw a lot, collecting images and absorbing the things around me. 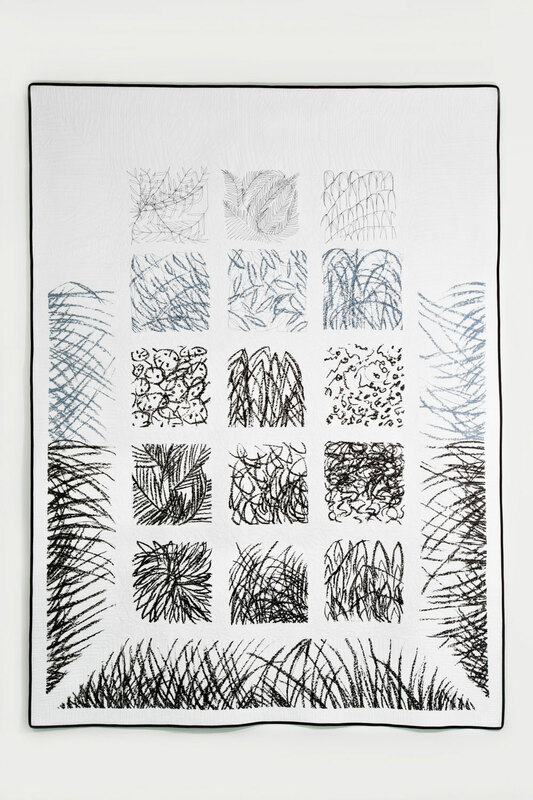 I often deliberately draw with a continuous line, which lends itself to quilting stitching; or with mark making which can lend itself to mono-printing. 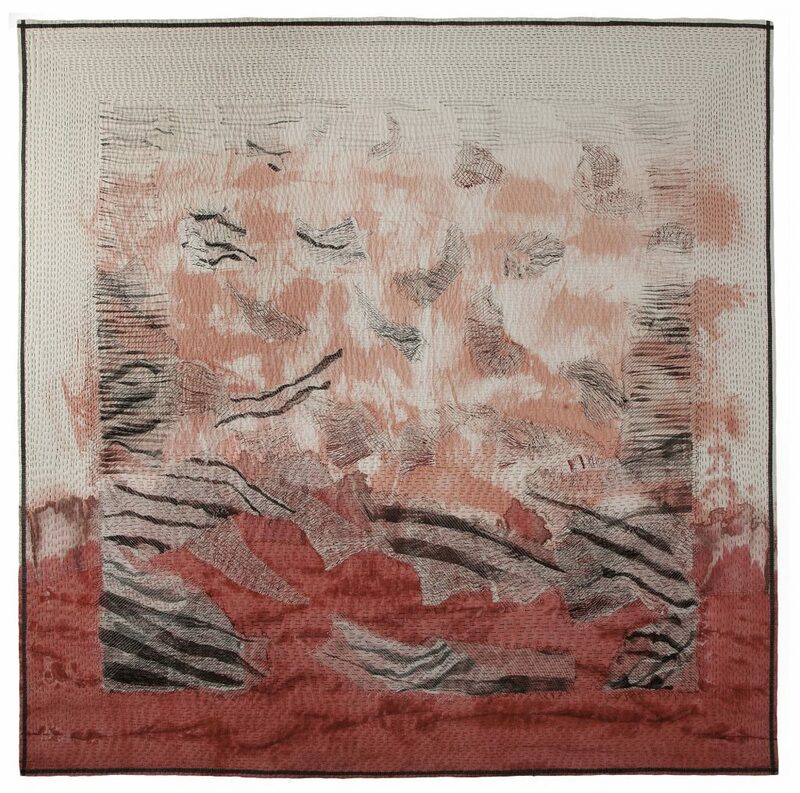 I often build up images from fabric samples, and assemble them onto larger pieces of cloth. I don’t plan too far ahead, but just work with the moment as much as possible, however I may make notes (drawn notes or words) that capture the direction in which I am aiming for, this can help me when I return to the work, after a break. You and your partner are both very creative, do you work on projects together/discuss ideas as they progress? We tend to only comment on each others work if we are invited, although we know that we influence each other very naturally, without really being aware of it. We have had several joint exhibitions, since we have been together – over the last 26 years of our married life. 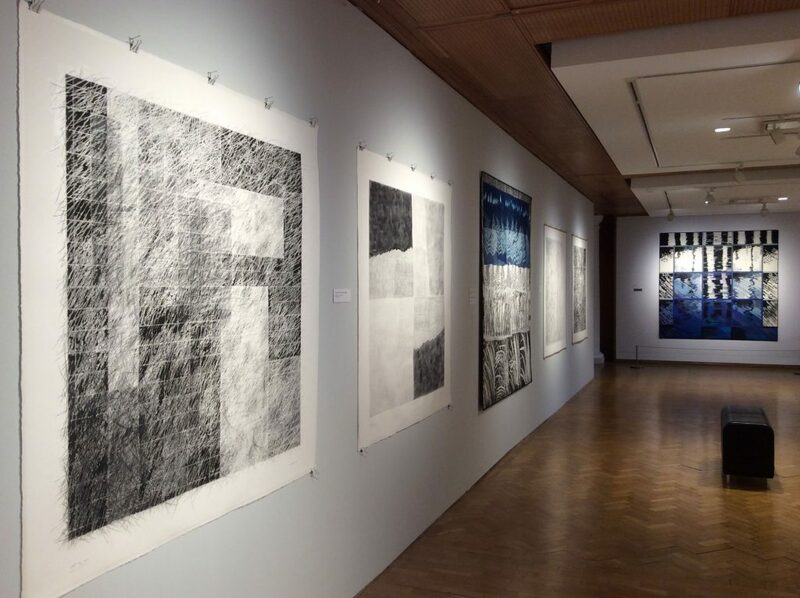 The most recent exhibition was called ‘Songs for Winter’ held over the winter months of 2017/18 in the Edinburgh City Art Centre has been a very successful show for us, our work hung beautifully together. We work individually, and never choose to make a collaborative piece. I don’t often feel unmotivated to be honest. I tend to have to de-clutter the many ideas before me, and concentrate on exploring one or two things. I make my own projects up and work through them until I feel that I have exhausted the possibilities around that subject, or that it no longer engages me – then I move on. The things that make me feel demotivated are more like administration jobs, on the computer etc. Except I know I have to do them for my career, but also for my clear state of mind. I have to get things in order, to allow me to be creative. What advice would you give to students who are undertaking courses with us, especially if they are considering a career as a designer maker? Try to put money earning, into a separate category (not a full time job), in order not to compromise your design work. And keep planning special time slots for your studio practice, however short they are, to keep the thread going. Pauline has recently completed an extensive body of studio work for her annual open studio exhibition which took place in August, alongside her husband Charlie Poulsen. It is a major event which they have ran for the last 25 years! You can view more of Pauline’s work here and follow her on Facebook.